For inkjet printing requiring duplex, high output and low cost the choice is simple… KR419 Duplex Printing Base. With the introduction of this new technology, product can now be printed on both sides at a fraction of the cost to duplex with traditional technologies. 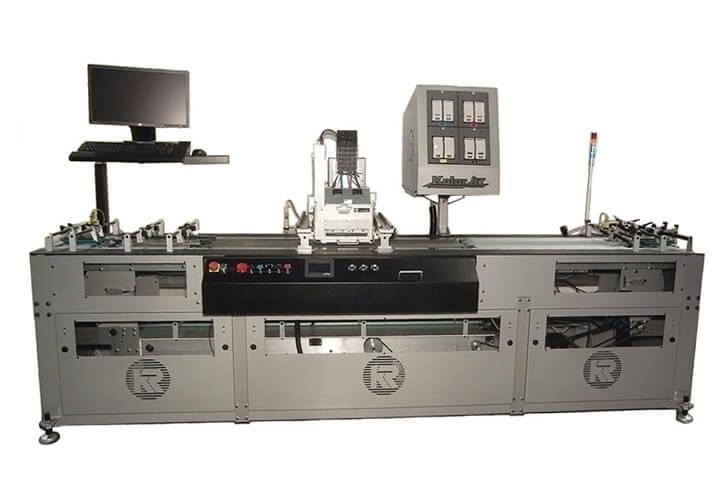 The KR419 transports the product to an inkjet print head, where the top side is printed. An air blast diverts the product to the lower conveyor where the product is turned over to reveal the remaining blank side of the product. The blank side of the product is seamlessly integrated between the product that is already on the upper conveyor and the remaining blank side is printed. The product is now transported off the end of the machine, ready for the next process. KR X-Match software tracks the product from start to finish, insuring accurate printing on demand. By having a lower cost duplex solution, the user can competitively price variable print process color options to both sides of the product, thus increasing promotional effectiveness to the customer. 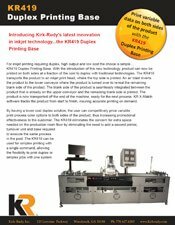 The KR419 eliminates the concern for extra space needed on the production room floor by eliminating the need to add a second printer, turnover unit and base required to execute the same process in the past. The KR419 can be used for simplex printing with a single command, allowing the flexibility to print duplex or simplex jobs with one system.